In early 1991, a group of people came forward to help a needy person with his medical treatment. This deed laid the foundation of Siliguri Subhaspally Welfare Organisation in 2002. The organisation is situated in Siliguri, West Bengal, and works towards development of weaker sections of society. This includes providing advanced medical facilities and vocational training for poor women and underprivileged section of society. The programmes are mostly focused in urban areas with a few of them organised in rural areas. Since 2000, the organisation has been operating a health clinic once every week. A diabetic clinic and eye testing camp is organised once a month. Various health awareness camps are conducted in government primary schools at regular intervals. Even ECG tests are conducted at affordable rates. The organisation conducts regular camps in urban and rural areas. Rural camps are organised free of cost. In urban camps, the organisation appeals to the people to voluntarily contribute small sums of Rs10/Rs20 as donations. The organisation provides a six month vocational training programme (Srijanshil) to poor women and artisans in various types of handicrafts such as jute work, jewellery, embroidery and fabric painting. On completion of the course they get an identity card from Ministry of Textiles, Government of India. This card helps them to gain employment or earn a subsidy from the government to start their business. Apart from the main objectives, the NGO has undertaken a project to create awareness about Right To Information (RTI). It also provides computer training to needy students, interested adults and housewives. The NGO works alongside the government by facilitating programmes such as Janashree Bima Yojana (insurance scheme for beneficiaries), Siksha Sahayog Yojana (scholarships for the children of beneficiaries) and SASPFUW (State Assisted Scheme of Provident Funds for Unorganised Workers) for beneficiaries. Total income: The organisation conducts health camps and handicraft classes and appeals people to voluntarily contribute a minimum of Rs10 as donation. These contributions are in the form of collections from eye camps, diabetic camps, ECG charges and Srijanshil programme (programme to train poor women and artisans in handicrafts). Other source of income for the organisation is donations raised from close acquaintances. 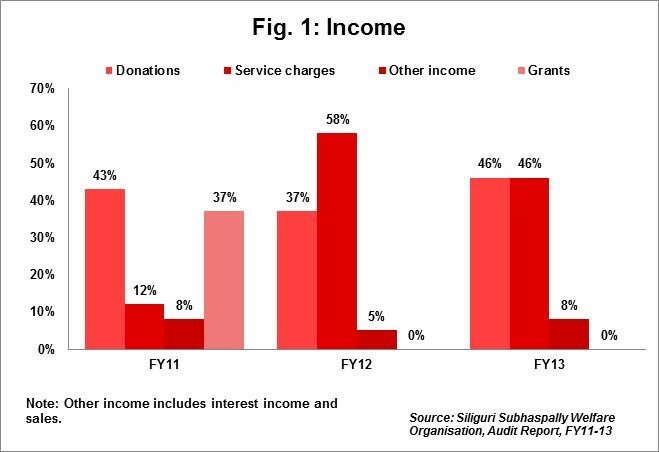 Donations and service charges each accounted for 46% (Rs78,000) of the total income in FY13. Programme expenses: Expenses aggregated Rs0.1mn in FY13, with 72% (Rs82,000) of total expenses incurred on core programme activities. The expenses incurred by other NGOs in same sector averaged 75%. The organisation paid consultancy fees in FY12 for 12A and 80G registrations and appointed a part time accountant with salary of Rs1,000/month in FY12-13. Apart from these, the organisation incurs no expenses on salary to the 39 members. 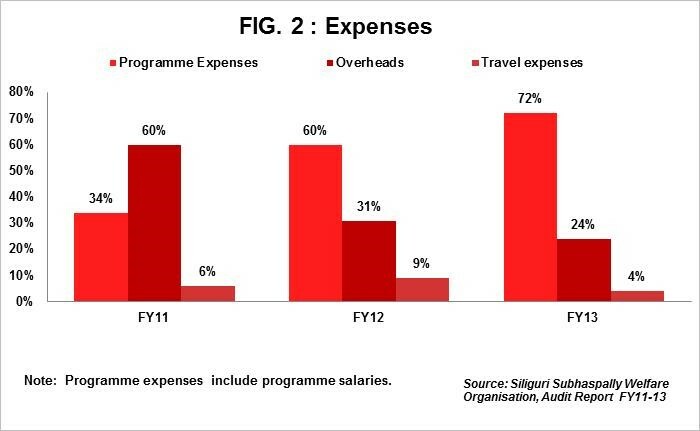 Programme expenses ranged from 34% to 72% during FY11-FY13 indicating effective utilisation of funds. Overheads: Overheads include administrative expenses such as insurance, electricity, stationery and repairs and accounted for 24% (Rs28,000) of total income (sector average: 14%). The expenses on printing and stationery declined considerably over FY12 and FY13 leading to sharp drop in overheads from Rs40,000 in FY11 to Rs28,000 in FY13. Fixed assets: In FY13, fixed assets accounted for 75% (Rs0.6mn) of total assets. The organisation owns a building where it arranges the health camps and conducts vocational training classes. Immovable assets comprising the building accounted for 45% (Rs0.3mn) of total fixed assets. Trust corpus and investments: In FY13, an amount of Rs0.1mn was set aside as trust corpus. These funds were invested in fixed deposits. Investments accounted for 21% (Rs0.1mn) of total assets in FY13. General funds: The organisation has managed to set aside a reasonable amount in general funds on account of Y-o-Y surplus recorded by the NGO. General funds increased from Rs0.3mn in FY11 to Rs0.7mn in FY13. Income Growth: The organisation posted an income growth of 37% in FY13 as against negative growth of 54% in FY12. The total income of the organisation was Rs0.1mn in FY13 with a CAGR of negative 14% during FY10-FY13. Despite being in existence for more than two decades, the NGO has managed to raise funds in the range of Rs0.1mn to Rs0.2mn. The organisation is located in the remote area of Kolkata, around 600km away from the city and has no contact with the corporate sector or the funding agencies. This can partly be the reason for its low income levels and raising concerns on of its growth prospects. However, the organisation has, so far, managed to raise funds from close acquaintances and from community sources for their programmes. Self-sufficiency ratio: The ratio measures the ability of an organisation to meet expenses out of its own funds and is calculated taking own funds as a percentage of total expenses. Own funds include donations and service charges. In FY13, the ratio was 147% as own funds were the only source of income and the organisation recorded a surplus of Rs54,000. The ratio appears high but is on a very low level of income, and raises concerns. Dedicated supporters: The organisation functions with the help of 39 members and 10 volunteers. They work voluntarily without charging any remuneration. This selfless dedication of the members and volunteers has enabled the organization to sustain and meet its objectives to a reasonable extent. Lack of funds: The organisation needs funds in order to expand its activities. So far, the organisation has managed to raise funds from close acquaintances which are barely sufficient to meet the existing needs. Hence, the organisation seeks external funding from corporates and funding agencies. Discontent among volunteers: The volunteers are reluctant to work without any remuneration. They expect some kind of compensation in the form of an allowance or reimbursements. The organisation foresees the challenge of losing out on its volunteers unless they surrender to their demands. There are nine executive members on the committee of the organisation. The members belong to diverse professional backgrounds and most of them are associated with the organisation since inception. As per rules of the Society Registration Act, the members meet once every month. The local newspapers have published articles appreciating the work of the NGO. The organisation is accredited by Credibility Alliance for accountability and transparency. The accreditation covers basic norms and is valid till August 2014.